Next post: Happy (weaving) birthday to me! I called up Lillian Whipple yesterday to see what she does about broken threads before wet-finishing, and she advised me that I could probably get away with just cutting them off after wet-finishing – if the fabric is tightly-woven enough, and if it is not being washed repeatedly in a washing machine, the broken threads won’t unravel.Â So I cut the dangly ends short (so they wouldn’t tangle on each other in the washing machine), and threw the fabric into the washer, warm wash and rinse,Â short agitation.Â When it came out, I pressed it using my handy little mini-press, which was much faster than ironing. Unfortunately, there seem to be differences between the mini-press and ironing.Â Ironing polishes the surface of the fabric, whereas the mini-press just presses it flat.Â There, literally, is the rub. The press, while TONS faster, does not polish the surface of the fabric, nor does it render the fabric supple.Â The silk came out of the press with a matte surface and a stiff, ugly hand.Â I tossed it into the dryer on “air fluff”, thinking to improve the drape, but while it softened up the fabric, it wasn’t nearly as supple as the ironed sample. So….I will have to redo the entire 16 yards (14 yards off this warp + 2 yards off the sample warp), spritzing it to dampen it and then ironing it dry.Â This will polish up the surface and (I hope!) restore the drape.Â Time consuming, hard on the shoulder, and extremely boring, but it’s got to be done.Â Fortunately, I only have to do the one side.Â The press did a decent job of pressing the fibers together, it just didn’t polish the surface. 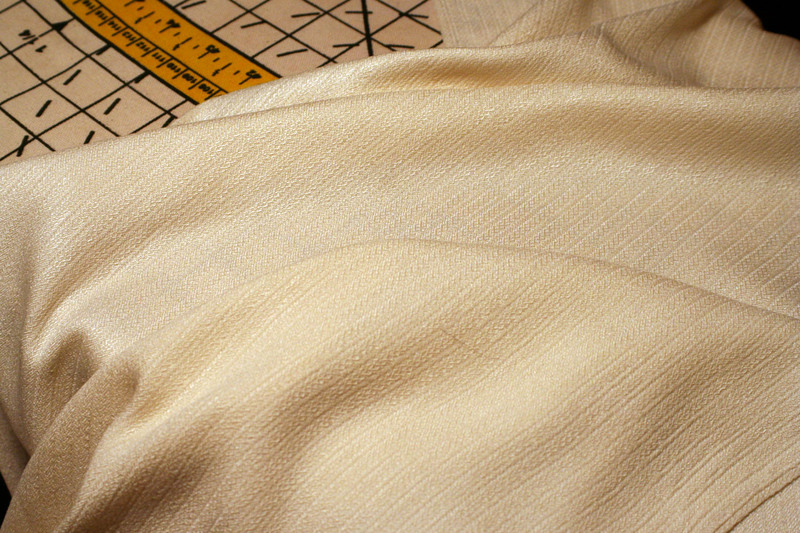 I posted a photo at the beginning of this post that illustrates the difference.Â The fabric in the foreground has been pressed but not ironed; the one in the background has been ironed.Â You can see clearly in the thumbnail, and even more clearly in the larger photo, that the ironed fabric has better luster and a clearer pattern than the pressed fabric. The good news is that ironing the fabric flat seems to have rendered the (major) flaws in the fabric from the floating shaft #23 mostly invisible.Â I need to inspect the fabric more closely and in better light, but it doesn’t seem nearly as visible as in the pressed-not-ironed fabric.Â I hope that’s true, because if it isn’t, I may have to discard about 2-3 yards of the fabric, which would be a real pity! I did test the compudobby box yesterday and it seems that the solenoid for shaft #23 is not firing correctly.Â Fortunately I do have a spare, but I better order a replacement from AVL, to keep a spare on hand. Unless ironing changes the dimensions of the fabric, pressing with your mini press may be adequate before cutting and sewing. Save the ironing until you are ready to construct the garment. Sorry about shaft 23. I put a piece of colored tape on the top of a misbehaving shaft so that I can quickly see whether it is being lifted.